Unsure what to get your valentine this February? 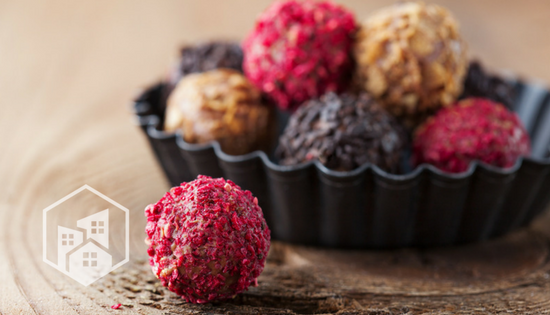 Make your sweetheart a batch of easy-to-make truffles and let them know how much you care. Bon Appétit! Get out your double boiler or make your own: set a glass bowl on top of a saucepan filled with an inch of water. Regularly stir so chocolate doesn’t stick or burn. Make sure any steam doesn’t condense on the inside of the bowl. When completely melted, add 2 teaspoons vanilla or up to a tablespoon of liqueur or coffee for flavoring. Pour into a casserole dish, cover with plastic and cool in the refrigerator for at least 3 hours or overnight. Take a spoon or small scoop and drag along the chocolate to get about 1 ounce. Roll between your palms to form a ball. Cover with your favorite topping, such as powdered sugar, cocoa, sprinkles, nuts or crushed candy. Once you have the yummy truffles prepared and ready for your loved one, make sure you wrap it with as much flair as it has of flavor. Grab some plastic wrap, a red napkin and a piece of ribbon. Place the napkin on top a sheet of plastic wrap, with truffles at the center. Bring the four corners of plastic wrap together and twist, as shown in the video above. Take the ribbon and tie a bow. And you’re set!